Invisalign® and Invisalign Teen® are the clear way to straighten teeth without braces, using aligners. Aligners are removable and virtually invisible, which means you can straighten your teeth without anyone knowing; and you can still eat and drink what you want. Also, you can brush and floss normally to maintain healthy gums and teeth; and there are no wires, metal or brackets to cause mouth abrasions. Total treatment time averages 6-14 months. 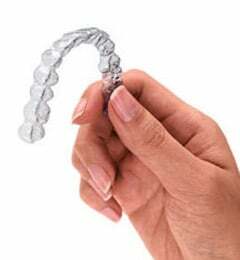 The typical number of Aligners is between 12 and 30.